Any many ways, Google is like a person. It changes with time, growing larger and more mature with each update. It’s important for business owners and marketers to keep up with these changes and update their strategies accordingly. Otherwise, it would be like a parent trying to relate to a teenager using the same tactics that worked when their child was five. During the recent Google Performance Summit, Google laid out planned changes to the way company sells ads. As is often the case with events like these, Google teased several upcoming features at their event. One of the biggest changes Google announced is that it will soon change the way advertisers set bids for targeting ads by device type in AdWords. The change in bidding has two major benefits for advertisers. First, it untethers desktop and tablet bids. Similarly, the change allows advertisers to put focus more on mobile advertising by letting advertisers to set separate bid adjustments for mobile, desktop and tablet. According to sources cited by Search Engine Land, advertisers will be able to set a base bid and then set bid adjustments for one or all device types in the range of -100 percent to +900 percent. “This lets you anchor your base keyword bid to the device most valuable to your business and then set bid adjustments for each of the other devices. You will also have a wider range to adjust bids, up to +900%,” explained Sridhar Ramaswamy, Senior Vice President, Ads and Commerce, in the blog post announcing the update. The news was also announced during Google Performance Summit in San Francisco. Another big upcoming change that was confirmed at the event (the change in question had been rumored for months prior) involved ad designs. Google confirmed impending changes to text ads that will give advertisers more copy. Since Google removed the text ads from the right hand bar, as was discussed in a previous article on this site, it has created space where the remaining ads can be streamlined. The result being advertisers will have two 30-character headlines instead of the current 25-character headline and one 80-character line of description copy instead of two 35-character lines. Additionally, the display URLs will automatically pull the landing page domain, but advertisers will be able to name up to two directory paths, neither of which has to be a real navigational path, to provide description about the landing page content. The final change of note during the first few days of the summit involves more dynamic and responsive ads. One of the challenges for advertisers is creating multiple ads that work on a range of devices and screen sizes. 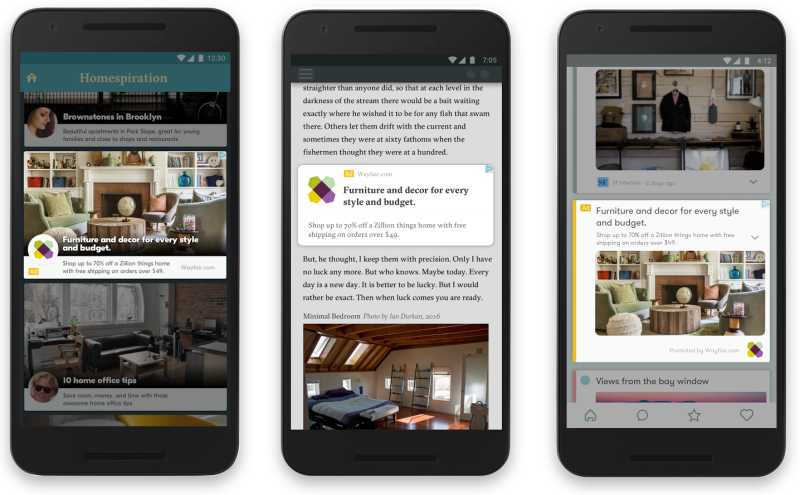 Google plans to make that easier by creating responsive ads for display that automatically resize and adjust to the look and feel of the content to tap into publishers’ native ad inventory. The ads are built dynamically by Google. Advertisers provide headlines, a description, an image and a URL. Business owners and marketers should be on the lookout for ways to use these new ad formats to their advantage. And for more news about upcoming changes to Google, read this article on Google’s plan for “Local Source” tags to make it easier to find local news sources.